Kandy (maha nuvara, pronounced [mahaˈnuərə], in Sinhala, கண்டி kaṇṭi, pronounced [ˈkaɳɖi], in Tamil), constitutes the English rendering for Maha Nuvara (Senkadagalapura), a city in the center of Sri Lanka. The name Kandy derives from the Sinhalese kaⁿda uḍa pas raṭa, literally "the five districts on the mountain." The Portuguese shortened that to "Candea," using the name for both the kingdom and its capital Senkadagalapura. In Sinhala, Kandy goes by the name Maha Nuvara (pronounced [maha nuʋərə]), meaning "Great City" or "Capital," although most often shortened to Nuvara. The capital of the Central Province and Kandy District, it lies in the midst of hills in the Kandy Valley which crosses an area of tropical plantations, mainly tea. Founded in the fourteenth century C.E., Kandy historically has served as the administrative and religious capital of the Central Province, which encompasses the districts of Kandy, Matale, and Nuwara Eliya. 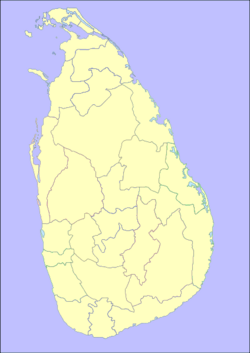 The city, one of the most scenic in Sri Lanka, had a population of 110,049 in the 2001 census. 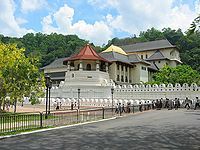 In spite of its loss of independence from 1815 to 1947, Kandy remained an important administrative and religious center. The two functions fused in the tradition of the Sacred Tooth of Buddha. The Royal Palace and the Temple of the Sacred Tooth, the temple housing the relic tooth of Buddha, have been declared by UNESCO as a World Heritage Site. Since the fourth century C.E., the tooth of Buddha had been a symbol of royal power. Possessing the Tooth of Buddha sealed a king's authority to rule. Without it, the royal authority did not exist. The Sinhalese people have preserved that tradition, the annual public display of the tooth of Buddha marking the proclamation of royal power. Buddhist pilgrimage to Kandy for the annual event, especially members of the Theravada school, crowding the city for the ten day procession. The event highlights the crucial role Kandy played in spreading Buddhism throughout Sri Lanka. The Sinhala kings supported the spread of Buddhism, nurturing a golden age in the Dinahala culture that survived for over 2,500 years. Historical records suggest that King Wickramabahu (1357-1374 C.E.) founded Kandy near the Watapuluwa area, north of the present city. He named the city Senkadagalapura at the time, although some scholars suggest he may have used the name Katubulu Nuwara. The origin of the popular name for the city, Senkadagala, could have had several origins. The city may have been naming after a brahmin named Senkanda who lived in a cave near the city, after a queen of King Wickramabahu named Senkanda or, after a colored stone named Senkadagala. In 1592, Kandy became the capital city of the last remaining independent kingdom in Sri Lanka after the coastal regions had been conquered by the Portuguese. 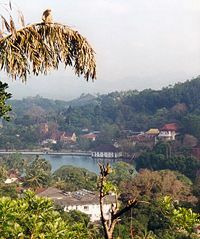 Kandy repelled invasions by the Portuguese and the Dutch in the sixteenth, seventeenth, and eighteenth centuries, as well as the British (most notably in 1803). The Nayaks of Kandy had been the last ruling dynasty of Kandy, preserving its independence until falling to the British in 1815. The British deposed the king, Sri Vikrama Rajasinha, and all claimants to the throne, thus ending the last traditional monarchy of Sri Lanka, and replaced it with British rule. As the capital, Kandy had become home to the relic of the tooth of the Buddha which symbolizes a fourth century tradition linked to royalty. The protector of the relic won the right to rule the land. Thus, the Royal Palace and the Temple of the Tooth associated with the administrative and religious functions of the capital city. Even after its conquest by the British, Kandy has preserved its function as the religious capital of the Sinhalese and a place of pilgrimage for Buddhists, namely those belonging to the Theravada school. Portuguese invasions in the sixteenth century and seventeenth century failed utterly. The kingdom tolerated a Dutch presence on the coast until 1761, when Kirti Sri attacked and overran most of the coast. He left only the heavily fortified Negombo intact. When a Dutch retaliatory force returned to the island in 1763, Sri abandoned the coastline and withdrew into the interior. When the Dutch continued the conquest into the jungles the following year, they suffered constantly from disease, heat, lack of provisions, and Kandyan sharpshooters, who hid in the jungle and inflicted heavy losses on the Dutch. Learning from their experience, the Dutch fielded a force prepared for the hardships in January of 1765, replacing their troops' bayonets with machetes and using more practical uniforms and tactics suited to rapid movement. They initially met with success, capturing the capital that had been deserted by the Kandyans who withdrew to the jungles, refusing to engage in open battle. The Dutch, worn down by constant attrition, came to terms in 1766. UNESCO designated the Sacred City of Kandy a World Heritage site in 1988. Citing Senkadagalapura, the name Kandy popularly went by, as a sacred Buddhist site serving as the last capital of the Sinhala kings. Their support fostered a golden age in which the Dinahala culture flourished for over 2,500 years. UNESCO noted the site of the Temple of the Tooth Relic, the sacred tooth of the Buddha, as a famous Buddhist pilgrimage site in their decision to designate Kandy a World Historical Site. The Palace of the Tooth relic, the palace complex, and the holy city of Kandy directly connect to the spread of Buddhism in Sri Lanka. UNESCO highlighted the Procession of the Buddha's Tooth in its designation of Kandy as a World Heritage Site. During the annual festival known as the Esala Perahera (ˈɶsələ ˌperəˌhɶrə), the ritual of bringing out the relic of Buddha began in the eighteenth century. A gold casket containing the tooth rides on a royal male elephant. During the procession, eighty elephants join in. Dancers colorfully swirl torches to fend of curses, the total number of dancers reaching 3,500. The procession goes on for ten days. 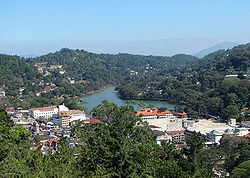 The city of Kandy sits at an altitude of about 500 m above sea level. Its plan developed around two open spaces: an elongated square with the administration buildings of the old capital at the end, and an artificial lake quadrangular in form. A public garden adds to the openness of the city's spatial organization. On the north shore of the lake, enclosed by a parapet of white stone dating to the beginning of the nineteenth century, the city's official religious monuments, including the Royal Palace and the Temple of the Tooth, known as the Dalada Maligawa (daḷadā māligāva), stand. Inspired by the temples of Sri Lanka's former capital city, Anuradhapura, the Dalanda Maligawa had been reconstructed in the eighteenth century on a base of granite. An array of materials (limestone, marble, sculpted wood, and ivory) contribute to the richness of this temple. A number of recently built Buddhist monasteries dot the city. Kandy has expanded, encompassing Peradeniya, home to the University of Peradeniya and the Botanical Gardens, Katugastota to the north, and east to Kundasale, Tennekumbura and Gurudeniya. Botanical garden. 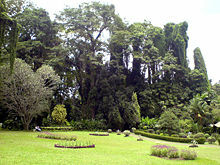 The Botanical Garden of Peradeniya, about five kilometers to the west of the city center at Peradeniya, attracts 1.2 million visitors per year. Culinary. Kandy has a modest range of restaurants, as well as an abundance of confectioneries. The range of cuisines available including Chinese, European, Sri Lankan, and Indian. Sport. Volleyball ranks as the National Sport of Sri Lanka but Cricket stands the most popular sport. The Sri Lanka cricket team plays international Test matches at the Asgiriya International Stadium. The Singer Sri Lankan Airlines Rugby 7's tournament, an annual international sporting highlight, takes place at the Bogambara Stadium in Kandy. Kandyans love rugby union. Kandy SC, the local rugby union club, has been champions of the rugby league for many years. Kandy schools have produced many national rugby players. Kandy has a majority of Sinhalese people; sizeable communities belonging to other ethnic groups, such as Moors and Tamils, also live in the city. ↑ UNESCO, Sacred City of Kandy video. Retrieved July 5, 2008. ↑ Department of Census and Statistics, Sri Lanka. Retrieved July 5, 2008. De Silva, T.K.N.P. 1988. Kandy. Colombo, Sri Lanka: Central Cultural Fund, Ministry of Cultural Affairs. McConnell, D.J. 1992. The Forest-Garden Farms of Kandy, Sri Lanka. Rome: Food and Agriculture Organization of the United Nations. ISBN 9789251028988. Mills, Lennox Algernon. 1965. Ceylon Under British Rule, 1795-1932; With an Account of the East India Company's Embassies to Kandy 1762-1795. New York: Barnes & Noble. Perera, C. Gaston. 2007. Kandy Fights the Portuguese: A Military History of Kandyan Resistance. Colombo: Vijitha Yapa Publications. ISBN 9789551266776. Kandy The hill capital of Sri Lanka. The Mary B. Wheeler Special Collection, University of Pennsylvania Library. Sacred City of Kandy Official UNESCO website entry. This page was last modified on 11 April 2018, at 14:17.